No. 39, Lorong Dato Yusuf Shahbudin 44E/KS 07, Taman Sentosa, 41200 Klang, Selangor, Malaysia. 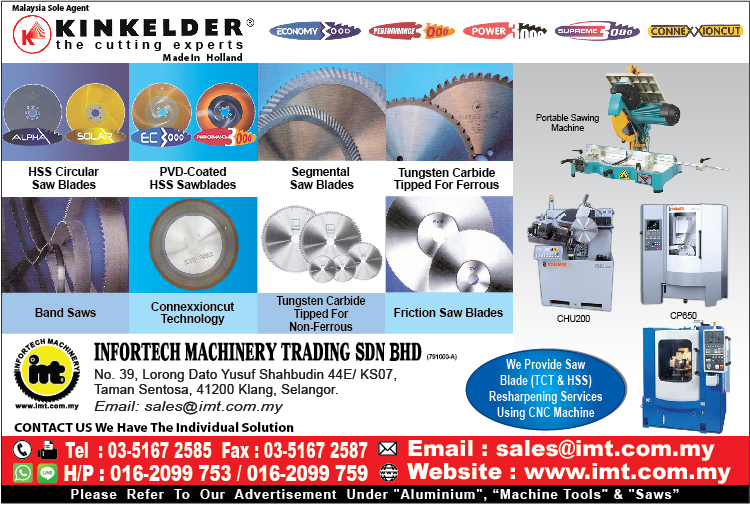 INFORTECH MACHINERY TRADING SDN BHD had started operating since 2003 as a partnership company and had become one of the leading companies in supply new machines used in all kind of metal, aluminium processing and sheet metal industry. e.g. Aluminium CNC machine center, Aluminium profile cutting machine, Tube Cutting Machine, Tube Bending Machine, Tube Grinding Notcher, Tube Chamfering Machine, Tube Forming Machine, New Circular Saw Blade, Saw Blade Sharpening service and etc. Our company is an aggressive, fast-growing and tech-savvy machine tools trading company devoted to its founding principles of quality, value and services. Customer can be rest assured over our expertise in this trade with over 20 years of experience. In conjunction with the rapid technology trend, we provide one stop solution concept including sales, service and maintenance to our customer in assisting them to optimize their business and needs. 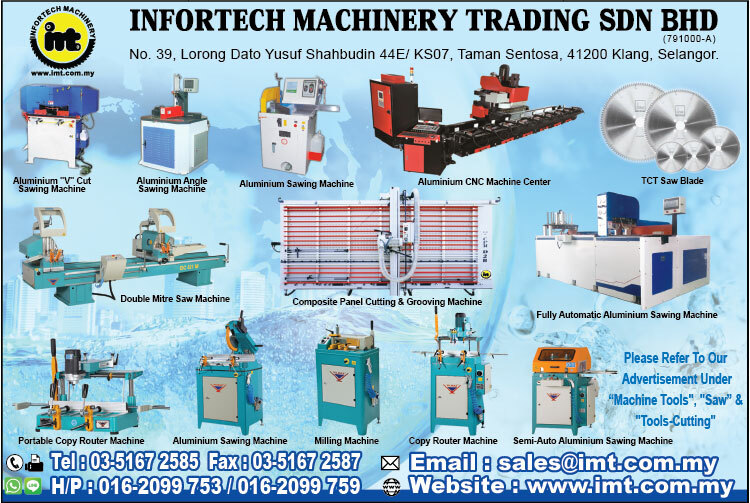 Infortech Machinery is currently being the Malaysia sole distributor for the quality CNC Machine Center, metal & aluminium cutting and processing machines like JIH-I, YILMAZ, KENTAI, GARBOLI, WALPOLE, etc. We always hold on to the protocol that we provide the best quality of products to our valuable customer. Besides, we are also the Malaysia sole agent for new circular saw blade manufactured by The Netherlands based Company, KINKELDER. In the coming future, we will keep on expand our products range to explore a larger market in this industry in order to serve our client better.